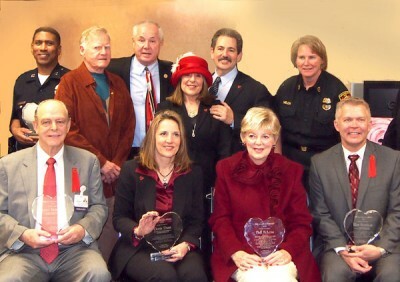 CIVIC COALITION board members presented GoodHeart awards at group’s Valentine’s Day event at Olympia Medical Center. Valentines were bestowed on the winners of the annual GoodHearts Awards on Feb. 14 at Olympia Medical Center. The awards, honoring extraordinary public service and arts consciousness, are sponsored by the Miracle Mile Civic Coalition. Councilman Tom LaBonge and Coalition chairman Lyn MacEwen Cohen gave awards to Doris Dunn, Farmers Insurance; Matt Simon, Caruso Affiliated; Fluff McLean, Windsor Square Hancock Park Historical Society; Steve Rosenthal, Olympia Medical Center and Ron Bowdoin, Park La Brea Management. Co-hosts were Olympia, The ARTery USA and First-In Fire Foundation.